Stonekettle Station: Holy mutton chops! 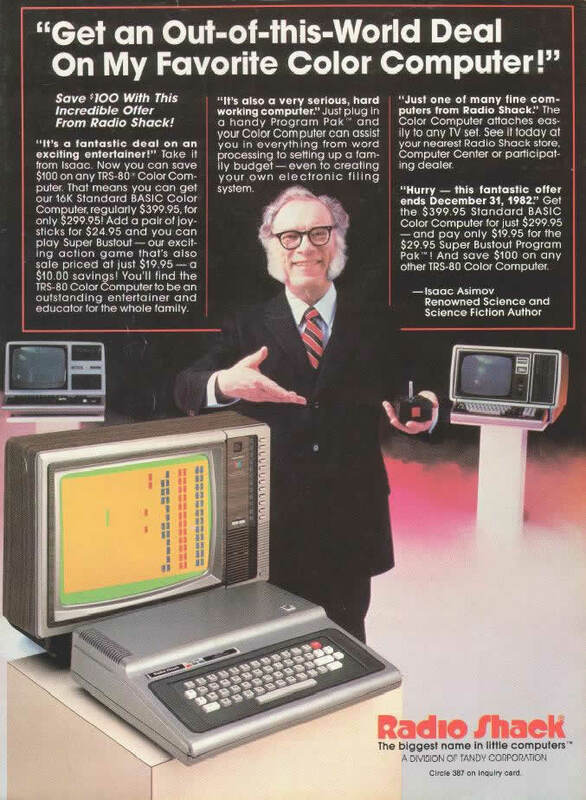 That's Issac Asimov hawking Tandy Computers in 1982. The Trash (sorry, TRS)-80. Dig that TV standard resolution and a whole 16k of RAM. Throw in an 8 inch floppy drive and copies of Super-Bustout and Electric Pencil and you're in the realm of science fiction. 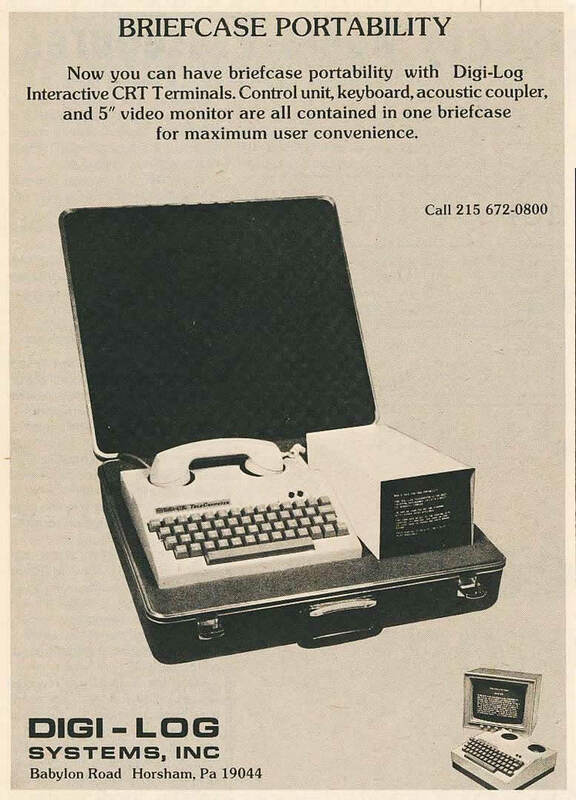 Ah, those were the days; heady times when the personal computer was new and exciting. Good luck finding a famous science fiction author to endorse Vista today. Yikes. Talk about a blast from the past! We had TSR-80s in the computer lab and library of my junior high school (and a few Apples in the library). They tried to teach us BASIC and LOGO. Everyone was going to have to learn a programming language because that's how computers were going to work--not only were you going to use your computer for things like grocery lists, but you were going to write the grocery-list-application all by yourself. They sure called that one wrong. OK fine. I'll stand up and put myself on the front line to be pelted with monkey poo. The folks at Apple are the ones who decided you should be able to use this stuff even if all you could do was type. Even hunt and peck. I luvs me my mac. Actually, as I recall, Radio Shack sold the Apple-II for brief time around 1977-78 or so, before they came out with their own Tandy line. I remember seeing one at a Radio Shack in the Woodland Mall, in Grand Rapids, MI. As I recall it was strictly green screen, but it had all these cool icons and a mouse - that was the first time I'd ever seen a machine with a mouse. I thought it was pretty weird. But there was this little paint program where you could draw circles and squares with the mouse - that was pretty cool. Oo, acoustic couplers! Back when we computed with bear skins and flint knives. Hey now, I think I actually have a 75bps acoustic coupler/modem around here somewhere. Janiece, I also miss the good doctor. Jim, that would have been an Apple II with a mouse card and MousePaint, a MacPaint clone for the Apple II which was bundled with the mouse card. But this wasn't available until 1981. Or the Apple IIGS, which came with a mouse and a Mac-like GUI, but not until September of 1986. In college we had one of the first Apple IIs, which all the geeks were always fighting over. And paper terminals with acoustic couplers. Later I was a lab assisitant part-time in a school lab with many, many Apple IIs, and I owned an Apple IIc. I even wrote a book about AppleWorks, one of the first integrated office suites for personal computers (see a brief mention of my book towards the bottom of this NY Times article from 1990). 86 is way to late, by then I was living in Spain and I owned my third "serious" computer - a Zenith Z-248 (80286, 640 RAm, 1 Meg extended RAM, 20MB HD, Windows v1.03 woofuckinghoo!) bought through the government purchase program. And how cool is it to see your name and book in an article in the NY Times? Very cool, I'd say. I remember the Zenith Z series computers. And I also owned a Commodore 64, a computer in many ways far superior to the Apple II, especially if you wanted to program. On a side note, I'm tinged a little green with the amount of the world you've seen. I have a younger brother who was in the Navy, and he still harasses me from time to time about all the world he saw while I was stuck at Keesler AFB in Mississippi my entire stint. As we say here in WV, thank God for Mississippi--they keep us from being last in everything! michelle K, heck yes. We kept pointing to Arkansas and Mississippi in a "at least we're not that bad" kinda way (Ohio ain't that far away form the bottom on a lot of things).